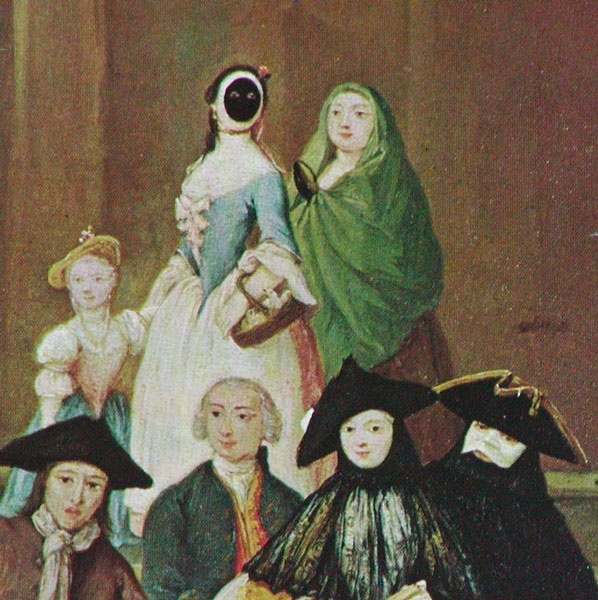 The Moretta was a mask used in Venice for a long time. 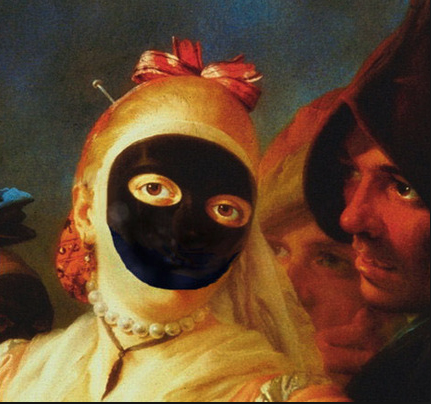 It also appears in some non-venetian portraits. 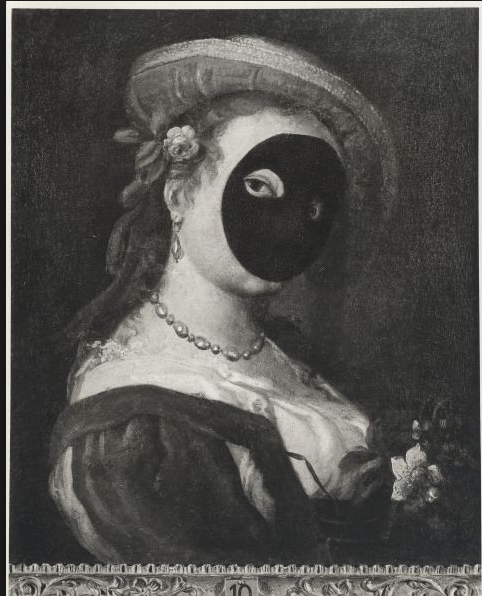 It is a black oval mask that covers the eyes and the moutch, but leaves empty the edge of the face, supposed to be very light in color, and so achieving a striking contrast. 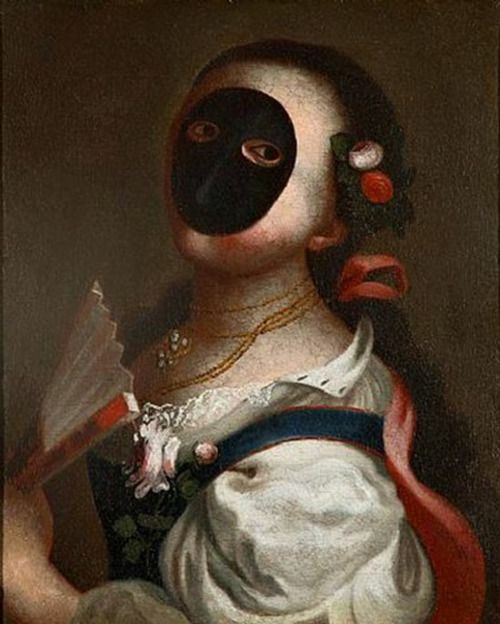 It was held on with a button to be kept between the lips and didn’t allow the wearer to speak, and this gave the mask the second name of “la servetta muta”, the mute servant (referring to a female one, servetta means little girl servant, but it doesn’t sound appelaling). While moretta means “little black one”. It is said that it was worn by women only, but that’s not true. 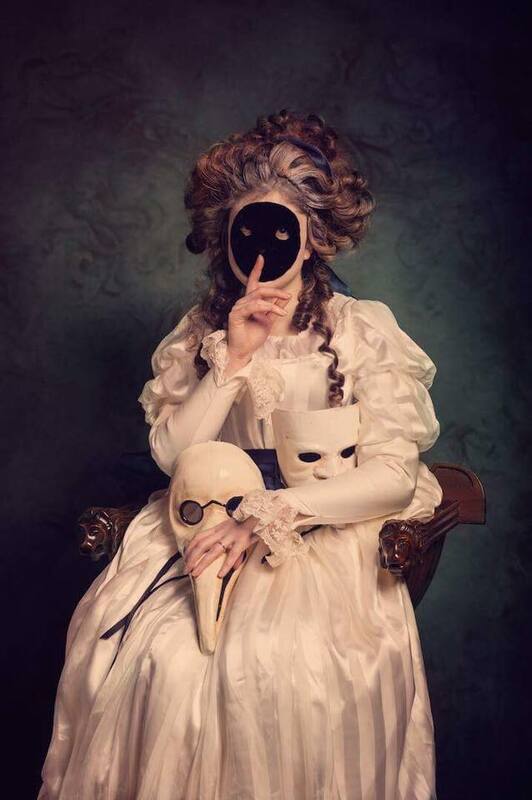 It was worn with women’s clothes, so even a man could conceal himself under female clothes and this mask, and do whatever pleased him, his voice concealed by the mask too. 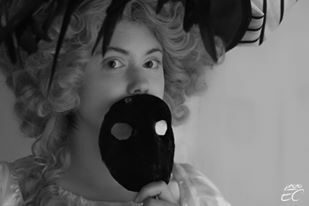 The fact that it inhibited talking made it the most identity-concealing mask of all, and it had quite a controversial reputation. 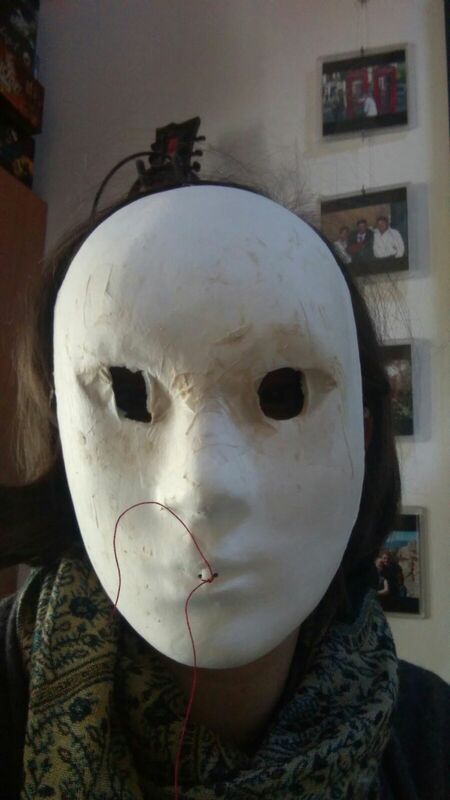 You can find the Moretta in real masks shops in Venice, even order it online. 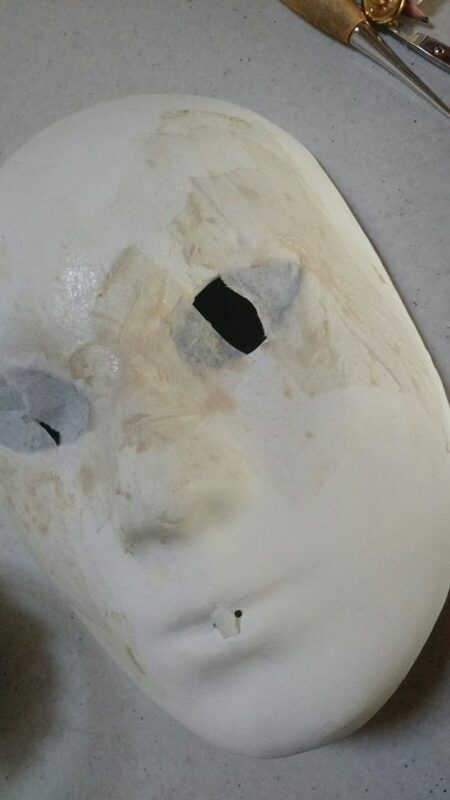 It’s not a mask that is made in sprayed resin, like the ones you find in the cheap chinese stores, or italian ones selling chinese stuff. You need to go to some authentic mask shop. I have gone there, but the one available is very wide, and its sides don’t lie down on the face, getting a very weird effect. Good to be hung up on a wall, but not for wearing. Also because it as no button, only ribbons. Also, it is polished in black, no black velvet. Both options were used, there are paintings where you can clearly see the shiny surface. However I like how velvet “eats” all the light, enhancing even more the contrast. 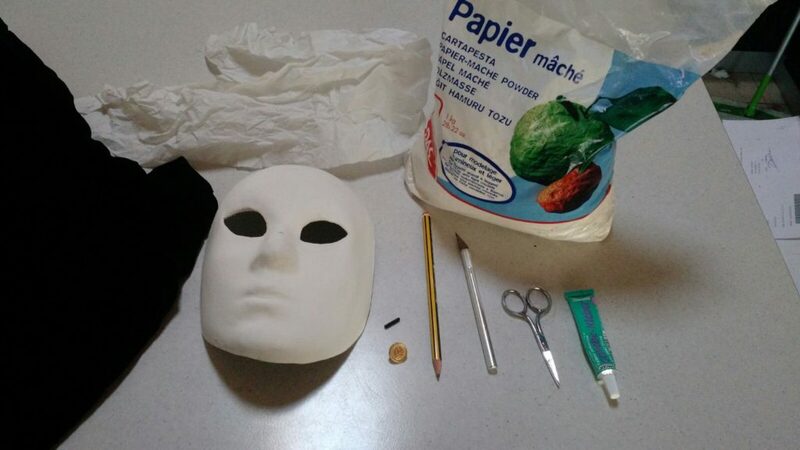 This tutorial is on how to make your velvet moretta, starting from a common mask. 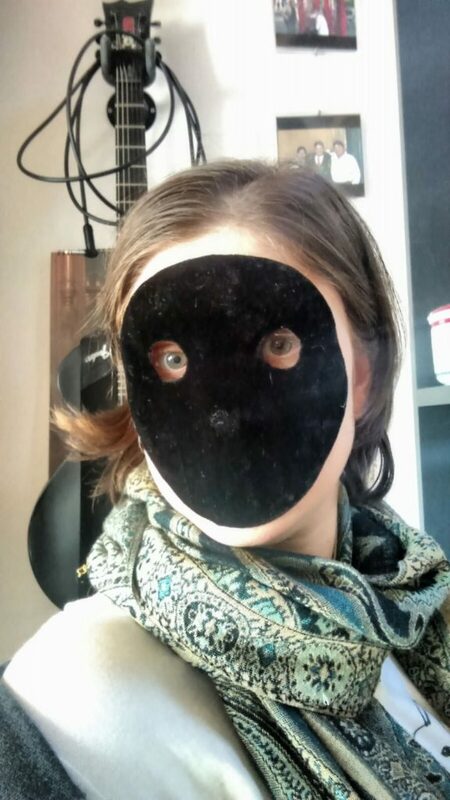 A full face female mask that lies well on your face. it needs to be cut, so the sprayed resin ones won’t do. 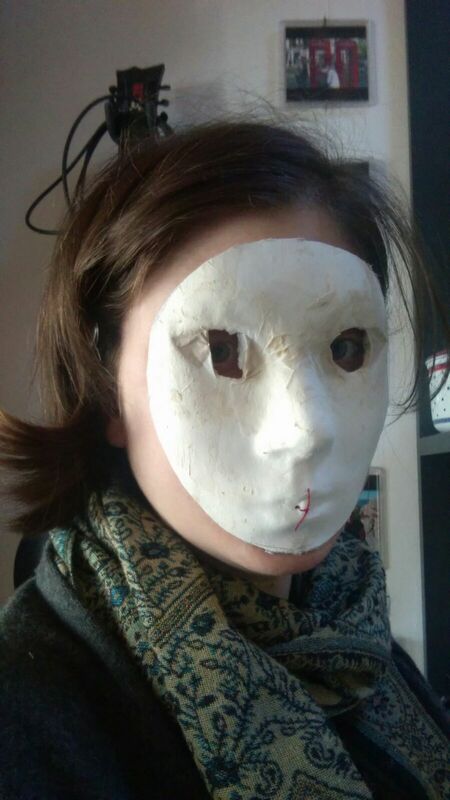 I made my first one using the ones in thin plastic you can get in many stores, byt it melts with gun glue, so I really suggest you to order a plaster and papier-mâché one from one of the many authentic venetian stores that also have online shops. a spatula or a brush to spread it. 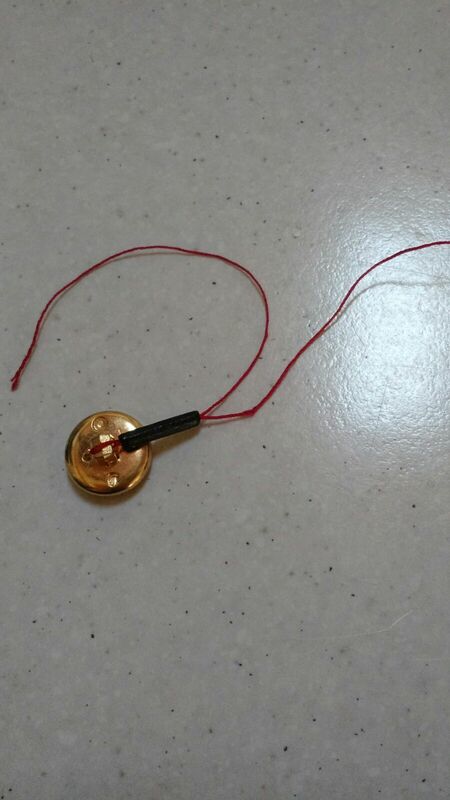 As first thing, you need to pierce two small holes in the center of the mouth, so you can tie the button. Once the holes are pierced, you will need to glue your little piece of something to prevent the little bridge between the holes to break. Now it’s the time to prepare the button. 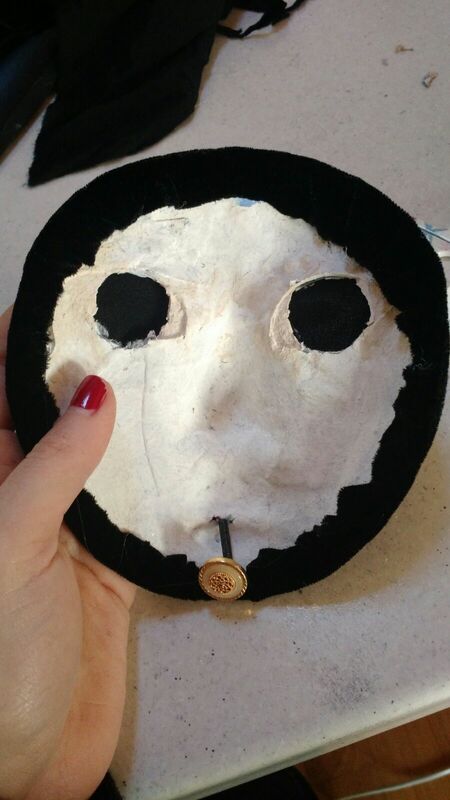 I have tried with my first version to make it very close to the mask, but it was very hard to hold on. So I made enough space to allow my lips space (1cm more or less). 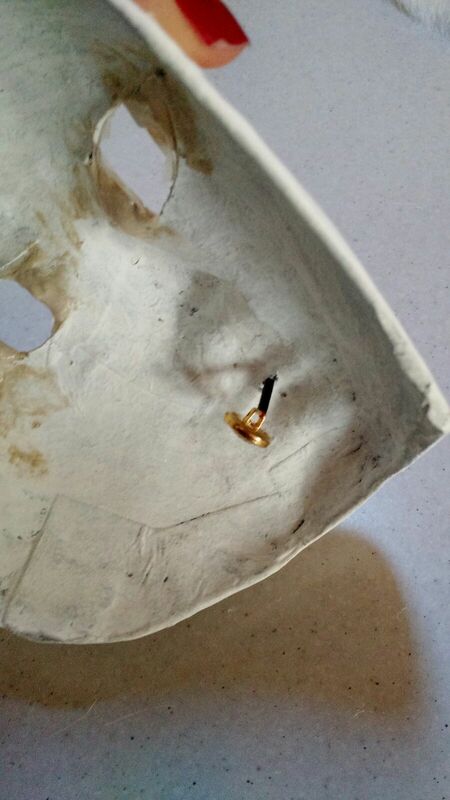 But after some hours of keeping them tight to hold the mask, I just went for a slightly longer thread, to hold the button with my teeth, so I can stay relaxed, and it works. You just need to add the tubular bead, so that your teeth do not cut the thread. I made a loop with the thread, at the end there’s the button, then both the halves of the thread are passed inside the bead, and then each one on its hole. Then I tied them on the outside, and cut the remnants. I then glued the knot with some fabric glue just to be sure it stays there. 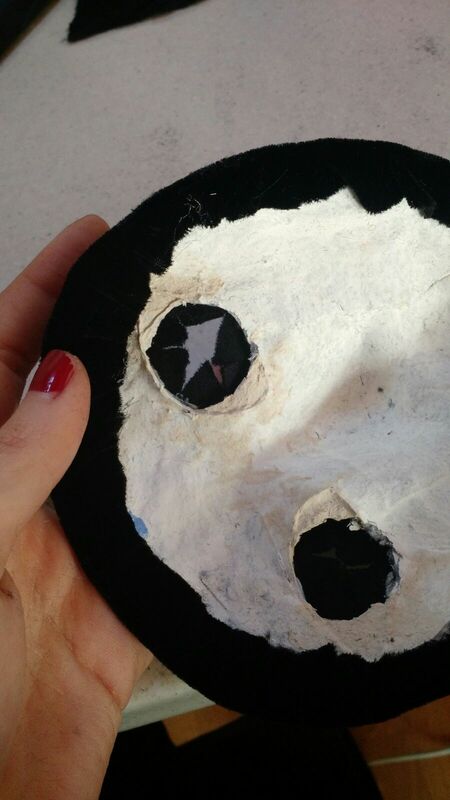 While it dried, I glued the tissue paper on the outside of the eyes, to fill the angles of the eyeholes. 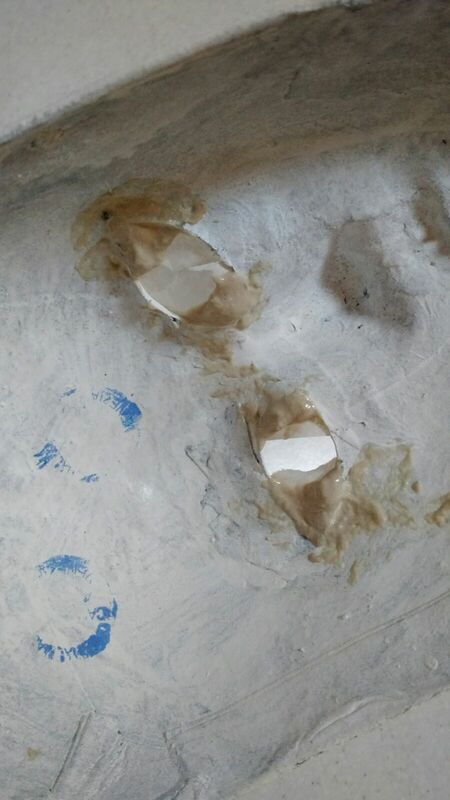 I used some powder papier-mâché to create a surface thick enough to glue the fabric on later. Doesn’t matter if the eyes look asymmetrical now, you’ll have to cut them. Wear the mask now, and see where to cut its edge. 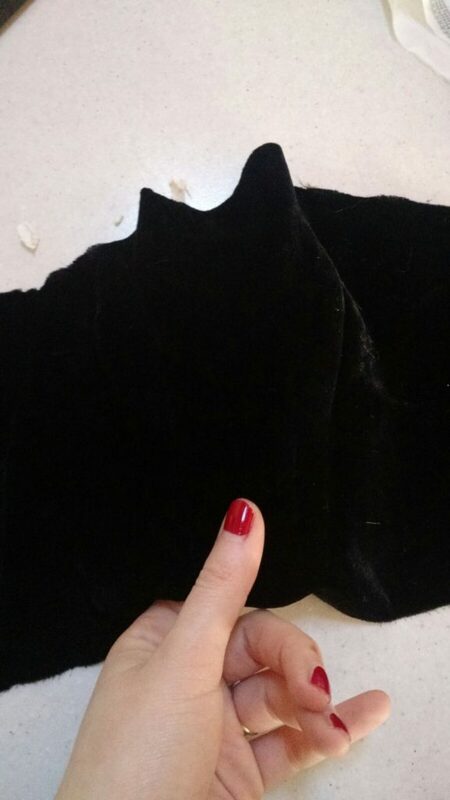 Consider than velvet has its thickness, and every edge of the inner mask needs to be two millimeters smaller than the desired effect. 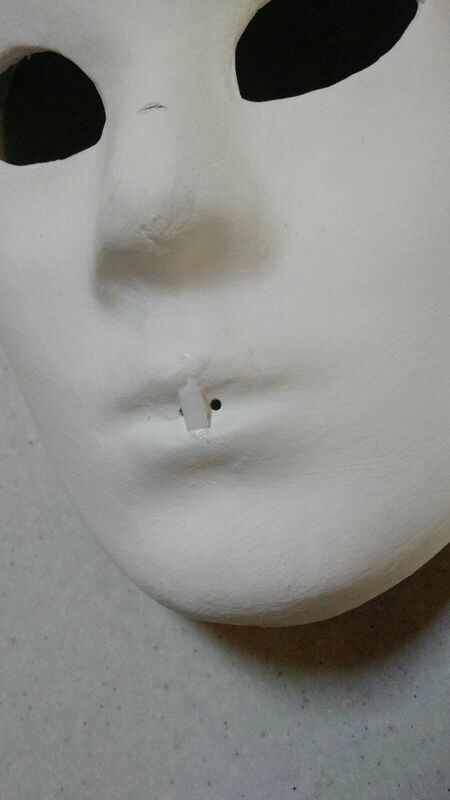 When you cut the edge of the plastic mask, take care once again to cover its blunt edges. 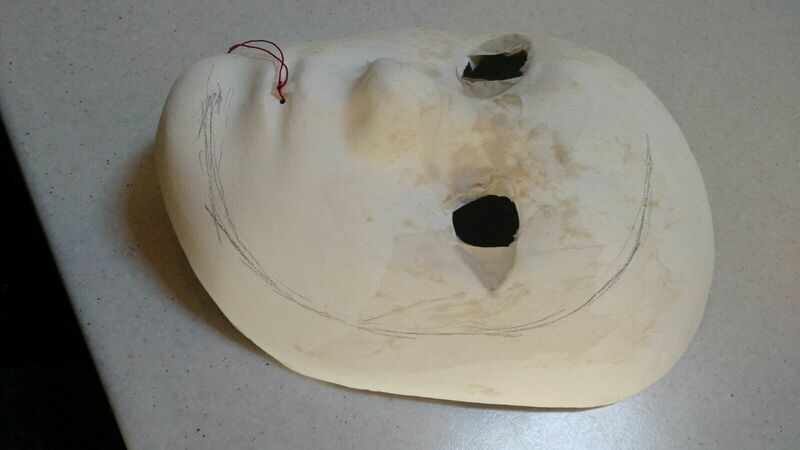 Some heat can work, but test it first on the cut away parts, so you know how to prevent the whole mask to crumple under the heat. 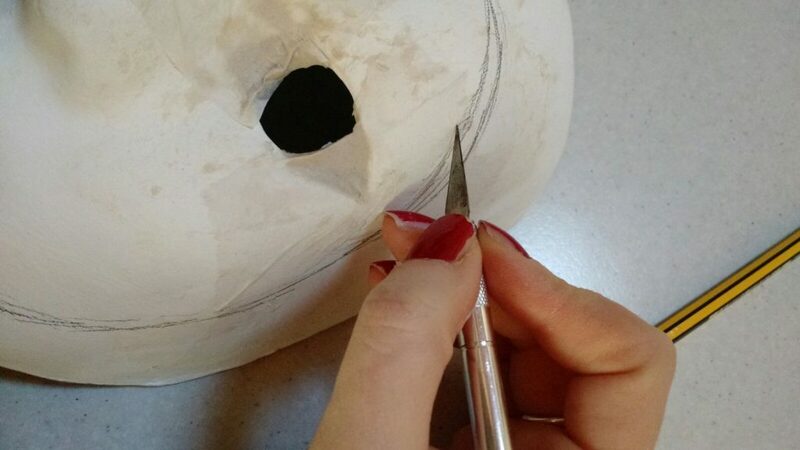 If you have the real mask, to achieve a neat edge, first use the cutter with some light pressure, just enough to make a clean cut over the while plaster part, and then complete the cut with scissors. Now cut two circles for the eyes. Pay attention to the size. A perfect circle is not strictly necessary, but if one eye is narrower than the other, it gets quite visible. Glue all the sides, and place the velvet carefully, so that there are no wrinkles and the fabric touches even the eyeholes. Even if the mask we started from doesn’t have the typical moretta shape, but it has a defined nose and lips, once you give the fabric the gentle tension it needs, you’ll achieve the perfect shape. 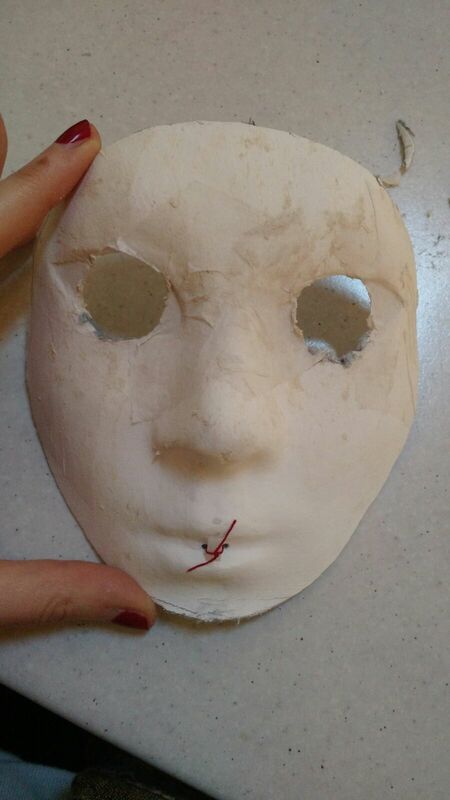 Now cut the excess, more or less 1,5cm from the edge of the mask. Glue the inner edge, and fold the “hem” back. 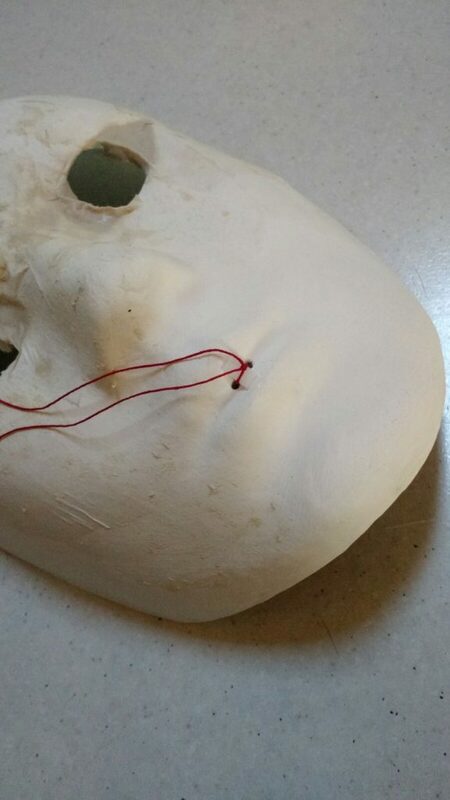 Hot glue is great for this with the non-plastic mask, because it helps you to do this fast, without having to keep e fabric down applying pressure, and possibly compromising the texture of the outer velvet. 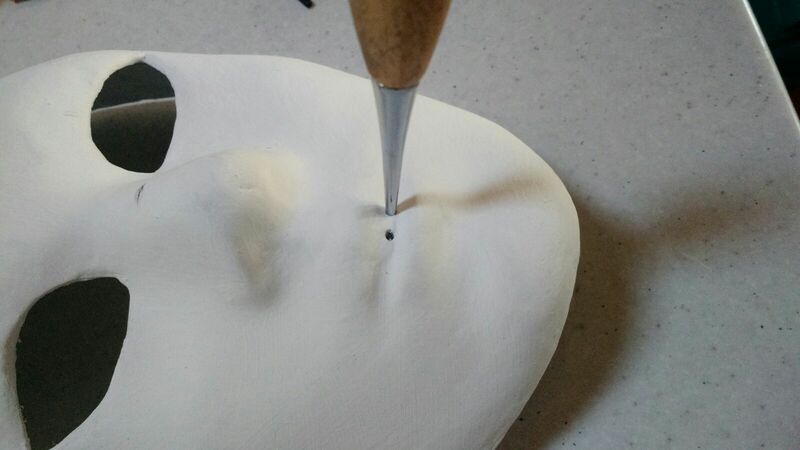 Pierce the center of the eye, and cut an asterisk stopping a couple of millimeters from the edge. Glue he edge of the mask and fold back the fabric. Check the symmetry and fix. I glued some trim to give a nicer finish, but this is optional. 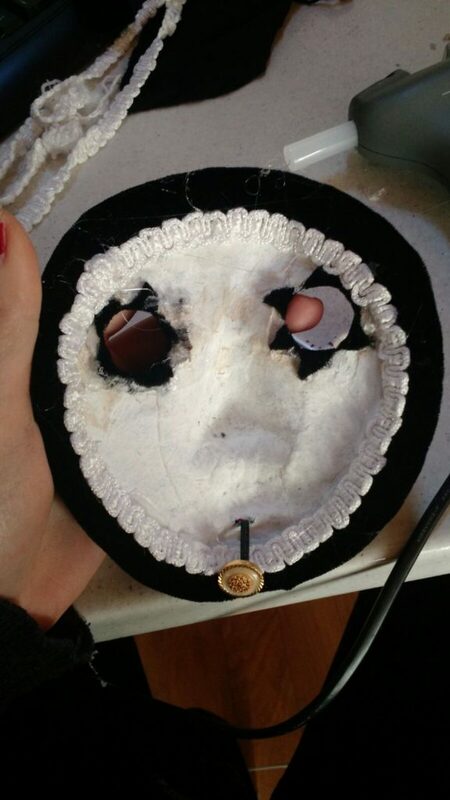 Now the mask is done! 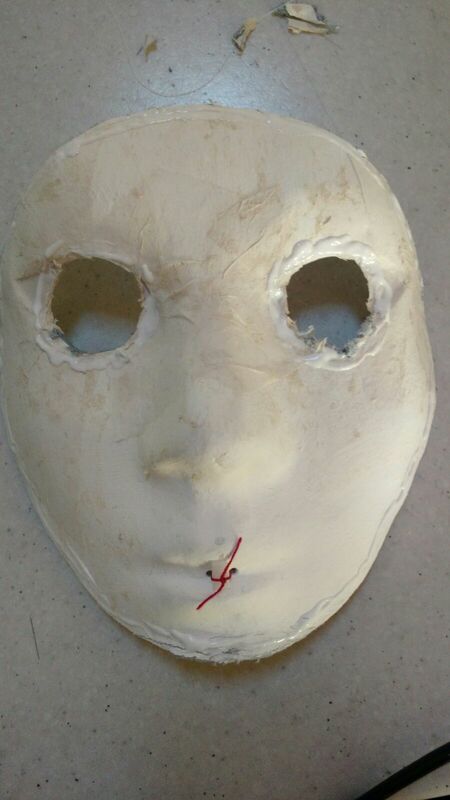 The one you see in the following pictures was the old one, done with the think plastic mask to start from. The one in the turorial is the new one I hope to wear with the red dress!